In 1798 the rural English physician Edward Jenner made a curious observation. His patients who had contracted and recovered from cowpox, a disease similar to but much milder than smallpox, seemed to be immune not only to further cases of cowpox, but also to smallpox. By scratching the fluid from cowpox lesions into the skin of healthy individuals, he was able to immunize those people against smallpox. The Cowpox (Catpox) virus is found in Europe and mainly in the UK. Human cases are very rare and most often contracted from domestic cats. The virus is not commonly found in cows; the reservoir hosts for the virus are woodland rodents particularly voles. It is from these rodents that domestic cats contract the virus. Symptoms of infection with cowpox virus in humans are localized, pustular lesions generally found on the hands and limited to the site of introduction. The incubation period is 9-10 days. 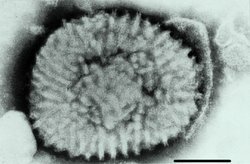 The virus is prevalent in late summer and autumn. Cowpox was the original vaccine of sorts for smallpox. after infection with the disease, the body (usually) gains the ability of recognising the similar small pox virus from its antibodies and so is able to fight the smallpox disease much more efficiently. We isolated Cowpox virus (CPXV) from the ulcerative eyelid lesions of a 14-year-old girl, who had cared for a clinically ill wild rat that later died.